Located at the 68th + 69th parallels north of the Arctic Circle in Norway, where tropical looking waters meet the mountains, a magical place named Lofoten exists. I have partnered with Hike365 and we have planned a Creative Camp for Adventurous Women on June 16th-23rd 2019 in the Lofoten Islands! Eddie Bauer is also graciously providing each attendee with an amazing gear goody bag (valued at $1,000 USD!) to get you set up right for Creative Camp! backpack – daypack or backpacking style, you choose! Check out the below PINTEREST board for details on what options you have to choose all of your awesome gear from! Once you are registered for our adventure up we will get your order placed and gear on its way to you with plenty of time for the Camp! When you pick up your bags up from the carousel in Leknes, get ready to begin an organized adventure creatively exploring the archipelago of Lofoten with myself and a small group of amazing women! This year will be my fourth time to Norway and Lofoten plays a large part in why I keep being called back year after year! As a professional photographer, community leader and a steward for the outdoors, my job as a creative is to capture the experiences and emotions that inspire us to pursue a deeper connection to our sense of place in the outdoors and to tell the stories that are behind this inspiration. Collaborating with fellow creatives and outdoor enthusiasts brings me a lot of joy, it’s refreshing, it’s inspiring and it provides new perspectives. It can be hard to make yourself vulnerable by putting yourself out there to collab, travel or in this case meet up in Norway with new friends! Finding the confidence to network with like minded people and then also organizing to connect in person can be intimidating. But since starting Hike365, I’ve learned that only beautiful things come from bringing a group of wonderful women together. Through organizing this Creative Camp, I want to make it easier and less overwhelming for women to get out there in a group setting and to do more of the off the beaten path experiences that our world has to offer! If you are experienced in the outdoors, love photography, have your own gear + are accustomed to moderately high levels of physical activity, this Creative Camp is for you! When it comes to food, our menu is varied and veggie focused and perfect for those who have a love for healthy and hearty plant-based meals! The itinerary has been designed for the outdoor woman who also strives to make the most of her daylight hours! At this time of year in Norway it is light 24 hours a day, which allows us to see and do so much! After a week of exploring with an awesome crew, you will return feeling fit + accomplished! After our adventure ends and you start to go through the stunning images captured during this once in a lifetime experience I hope that you will reflect on the friendships you’ve made and also feel creatively inspired! Have I peaked your interest? Keep reading for an overview of all of the epic adventures, food and experiences I’ve organized for us! You will also find information on pricing below! Can’t wait to see you in Norway! Travel Day to Leknes *you are responsible for your travel to and from Leknes. Overnight at Hattvika Lodge in a luxury 3 bedroom cabin on Hattvika Bay with views of the mountains and water. Light lunch and trip kick off “meeting” – feel free to nap if needed! Enjoy a sauna before bed and a glass of wine or cup of tea with our awesome crew of creative women! Early start with breakfast at our cabin (oatmeal, fruit, yogurt, coffee etc). Travel to the nearby village of Henningsvær for coffee and pastries while checking out the shops and galleries. Picnic Style Lunch – build your own sandwich, fruit, snacks, chocolate etc. Afternoon hike and photo session. Evening hike and photo session. Sauna, wine or tea, then bed! Early start with hearty breakfast at our cabin. We will hit the road to Kvalvika Beach trailhead taking plenty of time to stop for mini hikes and photo sessions along the way! Group lunch, shore picnic styles! Late afternoon backpack into Kvalvika Beach. Evening photo session adventure in and around the bay. Beer or tea, conversation, books, then bed! Midnight hike up Mt Ryten for those interested! 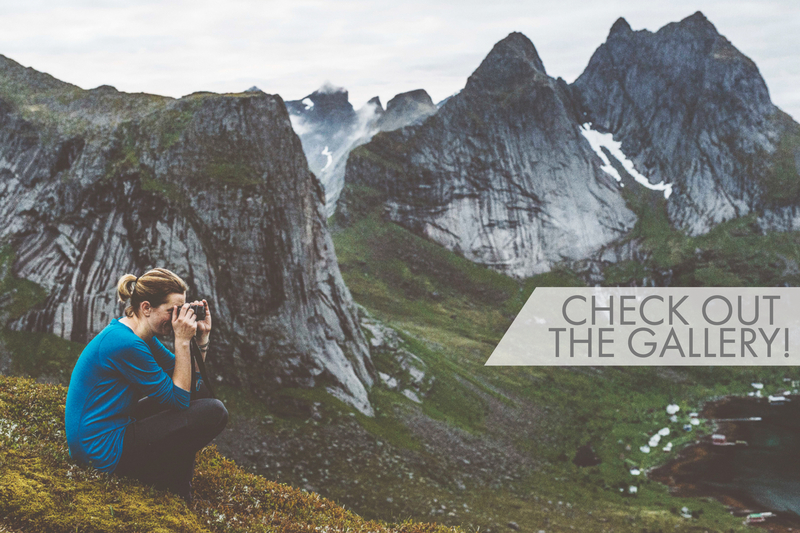 Travel to Reine taking plenty of time to stop for mini hikes and photo sessions along the way! Meet with the crew at Reine Adventures and head off on a kayak trip TBD by our host followed by a backpack into some of the more remote mountains of Lofoten! Evening photo session in and around our camp site. Midnight hike for those who are interested! Midnight Hike will be strenuous with lots of elevation gain in a short period of time. Early start once again with a hearty breakfast and coffees. Backpack out to our kayaks. Kayak out and back to Reine. Travel to the village of Nusfjord with stops along the way for photo a session. Travel to beach camp location near Nusfjord. Late night photo session in and around our camp site. Early start with hearty breakfast and coffees. Travel to the beautiful village of Hamnøya for a photo session. Travel to trailhead to Munkebu Hut – to the summit of Hermannsdalstind. Hike to Munkebu Hut and the summit of Hermannsdalstind. Hike: 11km Return // Elevation: Strenuous // Difficulty: Moderate // Duration 6 Hours. Travel to Unstad Arctic Surf. Late night photo session in and around Unstad and beaches. Celebration of Summer Solstice with beer, tea, conversation and saunas! Fat bike, skate the mini ramp or hike in and around Unstad. Day hike up mount Nonstind. Hike Nonstind and photo session. Option to take a surf clinic or rent gear if you’re game! Beers or tea, saunas and conversation, books, then bed! Norway is very expensive – like uber expensive! I’ve worked very hard to find a balance budget wise for this Creative Camp and am able to offer special pricing of $1,499 USD / $1999 CAD per person! A $375 USD non-refundable deposit is required at the time of booking to secure your spot. Don’t delay on scoring a spot because we only have 4 left! $375 USD / $475 CAD Deposit required to secure your spot in this awesome camp! The Creative Camp is not described, sold or intended as a tour or workshop. This trip has been organized to bring together fellow female creatives with both experience in and a love for: travel, photography, hiking, backpacking, kayaking, surfing, cooking and more. The pricing per person to participate in the Creative Camp reflects the idea of bringing women together to embark on an adventure together as opposed to a tour or workshop where you follow a specific schedule, your meals are catered etc. By joining in the fun of this Creative Camp, you should want to participate in cooking, have your camera out often and be ready to shoot, be excited to actively engage in the discussion and planning of our goals for each day, and hold a desire to help your fellow creatives out when needed. But most of all you should want to – HAVE FUN! What’s Included in your trip! All transportation within the trip itinerary from June 16th-23rd. All meals except those defined as pay-yourself. Our meals will be primarily vegetarian with the possibility of some seafood and fish! 4 Nights at a Luxurious Cabin – 2 at Hattvika Lodge / 2 at Unstad Arctic Surf. 1 Night of Tent Camping in and around Nusfjord. If inclement weather occurs on these two nights of camping and we decide to stay in a lodge or hotel, you will be responsible for covering your own accommodation fees. 1 Guided Overnight Kayak Trip. 6 Group Meals Cooked Together (You’ll cook anywhere from 2-3 dinners with another creative camp attendee). 1 Dinner c/o Kayak Guide. 5 build your own lunches + snacks. Awesome company from amazing women on all of our scheduled hikes, backpacks + overnight trips. Access at all times to our shared stove + grill. Access at all times to our shared cook ware, coffee, tea and allocated group snacks. You are responsible for all fees, flights, car rentals, ferries etc associated with getting your lovely self to and from Leknes. If you have questions about how to get to Leknes, please reach out to me and I will be more than happy to go over a few different ways you can make your way to Lofoten for our adventure! Cost of any excursions or activities outside of our sea kayak trip, specifically if you wish to take a surf lesson at Unstad Arctic Surf. If you wish to take a surf lesson, the cost is approximately $110 USD and includes necessary gear + instruction. Trail snacks, pick me up snacks, midnight snacks. Dietary Restrictions. Due to the small scale of this Creative Camp and having group meals, we cannot cook multiple versions of our meals each time. If you have dietary restrictions, I am happy to work with you to accommodate your needs. You will be responsible for cooking your own meals, providing your own snacks and paying for any food item additions made to the scheduled group grocery cache. Airfare to + from Leknes: It is your responsibility to arrive on time to our pick up location at the Leknes Airport. Travel Insurance: you are required to provide and carry proof of personal worldwide travel insurance in order to join the camp. If you do not have travel insurance, all major credit card companies offer it at reasonable rates, along with your car/home insurance provider. A note on liability: Viktoria Wakefield, Hike365 + all representatives of the Women’s Creative Camp are not liable for your person. You are required to read, understand and sign a number of liability waivers both via email and in person prior to our trip dates. Prefer email? Send a message to media@northbirchgrove.com ! I’m almost always available and am happy to go over anything and everything about this trip with you because I would love to have you join the camp! Do you want more information on the reason behind the pricing? If you do, I’m more than happy to explain what are the high cost expenses for our group and share with you how much time I’ve put into both visiting this area of Norway and in planning our adventure! CLOTHING: The average temp this time of year is 12 degrees celsius + rain does happen! solar charger, portable charger etc.